July 14th, 2010 11:52 AM | by William Bell | Eschatology. begin the millennium of a 1000 years. Unlike Premillennialism espoused by Lindsay and other Leftbehind advocates which holds the millennium to be yet future, it suggests the thousand years reign commenced in AD 70 and is ongoing. As such, it shares partly in the “present millennium” view of Amillennialism only differing in the time of inception by 40 years. Amillennialist teach that the millennium began in A.D. 30, following the ascension and coronation of Christ, whereas the “prepret” view holds it began 30 years later. I’m sure this is very confusing and so it is to the writer to some extent. To make it even more fun, the Postmillennial partial preterist believes that the millennium occurred from Pentecost until A.D. 70, but inserts the last days for the current time. So, the last days of Partial Preterism chronologically equals the millennium of Amillennialism and PrePret millennialism. Yes, its a brain burner. On the other hand, the full preterit view of the millennium is that it occurred from about A.D. 30 at the ascension and coronation of Christ upon David’s throne and ended in A.D. 70 at Jesus’ coming in judgment upon Jerusalem. So, where the PrePret has the millennium beginning many full preterists see it as the terminal point. It doesn’t matter which view is taken, it must be concluded that the millennium is not literal but figurative. Why? Because according to the text in Revelation 20:4, those in the millennium live and reign with him a thousand years. We will examine this in the light of the views expressed above. First, let us take the Premillennial Preterism view espoused by Dr. Duncan McKenzie. If the millennium began in A.D. 70 and ends with the alleged future coming of the Lord, then the it must be a figurative representation of a thousand years. For a literal thousand years cannot extend beyond that number. 1900 years and counting does not equal one thousand. Thus, if the alleged future return of Christ is another thousand or million years away, the millennium is certainly a figurative number. The same goes for the Amillennial view. Whatever time extends from Pentecost to A.D. 30 to the present and beyond means that the thousand years is figurative for the same reasons above. The verdict is still out on the Premillennial view because they hold the event to be in the future, thus ascribing it to a literal one thousand years. But their view is merely speculative theory. Until it happens, it’s just blowing smoke. Further, for those who are pretrib and mid trib, they must add three and a half to seven years on the time anyway to account for their alleged future great tribulation. The Partial Preterist “historical view” of the millennium likewise holds it out to be a “figurative” millennium. For it would commence from A.D. 30, and end with the fall of Jerusalem in A.D. 70. That is the veiw expressed by Dr. Kenneth Gentry, Jr. in the book Three Views on the Millennium. Thus, the “thousand years” covers a 40 year period confined only to one generation, namely those in the first century. The commonality in all the views above is that they see a yet future final return of Christ extending far into the future. 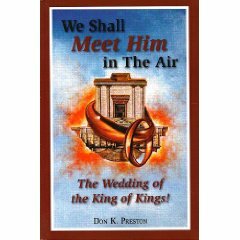 Similar to the partial preterist, the full preterist holds the pre-parousia reign of Christ starting on Pentecost A.D. 30 as the beginning of the Millennium when he sits upon the throne continuing until all enemies are placed under his feet in A.D. 70. That again argues for a figurative thousand years reign. Only, at the end of the millennium Christ’s coming in judgment on Jerusalem is the consummate coming and beginning of His eternal reign with the Father, Rev. 11:15; 22:4-6. Click here to learn more about fulfilled prophecy. « Is God Late on Fulfilled Prophecy?